Centrifuges I Microscopes America, Inc. These high quality Lab Centrifuges help you spin and separate particles & samples with speed and precision in your science classroom, medical laboratory, or general science lab. These products offer a number of convenient available features, including timers, speed control, auto shut off, and locking lids for secure operation. 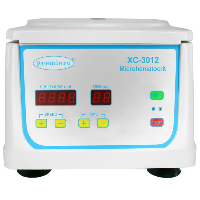 This centrifuge is the ideal choice for medical, scientific, clinical and industrial applications and is commonly used to separate blood and other cells, spinning urine, PRP, PRF and cell washing.. The XC-2415 offers a variable speed selection from 1000 to 4000 rpm that is adjustable in 100 rpm increments, achieving an RCF range from 120 g to 1933 g. This reliable bench-top centrifuge features a fixed-angle Aluminum rotor that holds up to 12 test tubes ranging from 10 ml to 15 ml in fluid capacity. The XC-2415 also features a continuous hold-spin function, a last-spin memory feature that remembers the previous operation and a 60 minutes timer that beeps once the cycle is completed. Tired of noisy centrifuges? Anyone that has experienced having multiple centrifuges running simultaneously can attest to fact that this noise brings both distraction and discomfort to the workplace. As such, the XC-2415 features one of our proprietary quiet motors generating an operating noise level of under 60 dB, in the hopes of helping you maintain a quiet and comfortable work environment. It is common knowledge that work areas are considered prime real estate in most labs and it is with this in mind that the XC-2415’s compact frame was specially designed to maximize your workspace. Now with your safety in mind, the XC-2415 centrifuge has been designed with an electronic locking feature that is engaged when the centrifuge begins spinning and also features a safety release latch beneath the unit which will allow you to open the unit in the event of an emergency. The XC-2415 also provides you with four suctioned feet that will hold the unit in place and reduce vibrations to avoid any slipping and shifting of the unit and avoid instances of tube breakage and contamination of the unit. The Premiere XC-2415 is CE certified; so whether you are running PRP, PRF, cell washing or simple fluid separation protocols, the XC-2415 is the ideal choice for medical, scientific, clinical and industrial applications. If you require a rotor that accommodates higher fluid capacity tubes is required, please check out our XC-2450 centrifuge. Please order by model number based on the desired rotor. • CAPACITY - Fixed-angle, Aluminum rotor holds 12 tubes, from 10 ml to 15 ml fluid capacity. 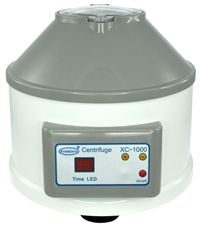 • COMPACT - At only 17" x 15" x 13" this centrifuge has a minimal footprint and offers excellent results. • QUIET - With an operating noise level under 60 dB, the XC-2415 is quiet enough to stand next to while having a conversation. • APPLICATION - This centrifuge is the ideal choice for medical, scientific, clinical and industrial applications and is commonly used to separate blood and other cells, spinning urine, PRP, PRF and cell washing. The XC-2450 offers a variable speed selection from 1000 to 4000 rpm that is adjustable in 100 rpm increments, achieving an RCF range from 114 g to 1828 g. This reliable bench-top centrifuge features a fixed-angle Aluminum rotor that holds up to six 50ml tubes. The XC-2450 also features a continuous hold-spin function, a last-spin memory feature that remembers the previous operation and a 60 minute timer that beeps once the cycle is completed. Tired of noisy centrifuges? Anyone that has experienced having multiple centrifuges running simultaneously can attest to fact that this noise brings both distraction and discomfort to the workplace. As such, the XC-2450 features one of our proprietary quiet motors generating an operating noise level of under 60 dB, in the hopes of helping you maintain a quiet and comfortable work environment. It is common knowledge that work areas are considered prime real estate in most labs and it is with this in mind that the XC-2450’s compact frame was specially designed to maximize your workspace. Now with your safety in mind, the XC-2415 centrifuge has been designed with an electronic locking feature that is engaged when the centrifuge begins spinning and also features a safety release latch beneath the unit which will allow you to open the unit in the event of an emergency. The XC-2450 also provides you with four suctioned feet that will hold the unit in place and reduce vibrations to avoid any slipping and shifting of the unit and avoid instances of tube breakage and contamination of the unit. For over 25 years Premiere has been making dependable laboratory centrifuges that stand the test of time. The Premiere XC-2450 is CE certified; so whether you are running PRP, PRF, cell washing or simple fluid separation protocols, the XC-2450 is the ideal choice for medical, scientific, clinical and industrial applications. If you require a centrifuge that holds more tubes, with a lower fluid capacity, check out our XC-2415 model. • CAPACITY - Fixed-angle, Aluminum rotor holds six 50 ml fluid capacity tubes. • QUIET - With an operating noise level under 60 dB, the XC-2450 is quiet enough to stand next to while having a conversation. With the versatile power of 2 centrifuges in one, the XC-2500 can spin 15ML and 50ML tubes — saving your customers diagnostic time, equipment cost, and counter-top space! How is this Used? Used in clinical settings for urine spinning, whole cell separation, cell washing, whole blood separation, pharmaceuticals, Platelet Rich Plasma (PRP), and Platelet Rich Fibrin (PRF). Where is this Used? Veterinary, blood bank (hematology), cosmetic surgery, toxicology, and general lab. • Programmable settings with bright and easy-to-read LCD display. • One touch panel for quick and easy timer settings. • Fixed Angled Rotor with adapters for 6 × 15mL or 50mL tube holders. • Built-in safety feature keeps lid closed while rotor is in use. • TIMER RANGE 1-60 min. • PRODUCT WEIGHT 18 lbs. Our new Microhematocrit quickly determines the packed cell volume by high-speed centrifugation of blood by using capillary tubes. This Microhematocrit has a top speed of 12,000 rpm and will spin 24 (75mm) or shorter capillary tubes at once. It has a timer that can run for a continuous 99 minutes and has safety features that include automatic shut off and a locking lid. The motor is brushless and built to last for high use labs. 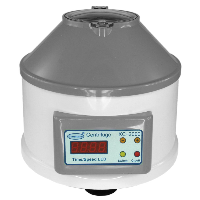 Designed for general laboratory use, this quiet, smooth spinning centrifuge is equipped with an auto shut off feature when the lid is raised. The shell is made of Industrial ABS plastic for durability and is easy to clean. It has a six-tube capacity, and includes two sets of holders (10ml and 15ml). The timer can be set from 1-60 minutes and includes a hold function for longer spins. A memory function remembers the unit's last operation settings. 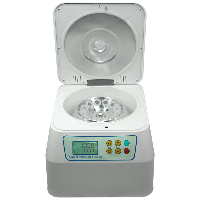 Designed for general laboratory use, this quiet, smooth spinning centrifuge is equipped with an auto shut off feature when the lid is raised. The shell is made of Industrial ABS plastic for durability and is easy to clean. This unit features variable one-touch programming of speed and time with an LED display panel. A memory function remembers the unit's last operation settings. • Variable one-touch programming of speed and time with LED display. •Quiet, smooth spinning centrifuge is equipped with an auto shut off feature when the lid is raised. •Shell is made of easy to clean ABS plastic for durability. •It has a six-tube capacity, and includes two sets of holders (10 ml and 15 ml). •Timer can be set from 1-60 minutes and includes a hold function for longer spins. •A memory function remembers the unit's last operation settings. •Speed: Range 1000 - 4000 rpm.